One research approach to tracking immigrant origins is to look at their neighbors where they settled. If the ancestor’s origin can’t be discovered, locating their neighbor’s homeland “across the pond” may help determine where they were from. It’s a good approach–but sometimes it may not work. 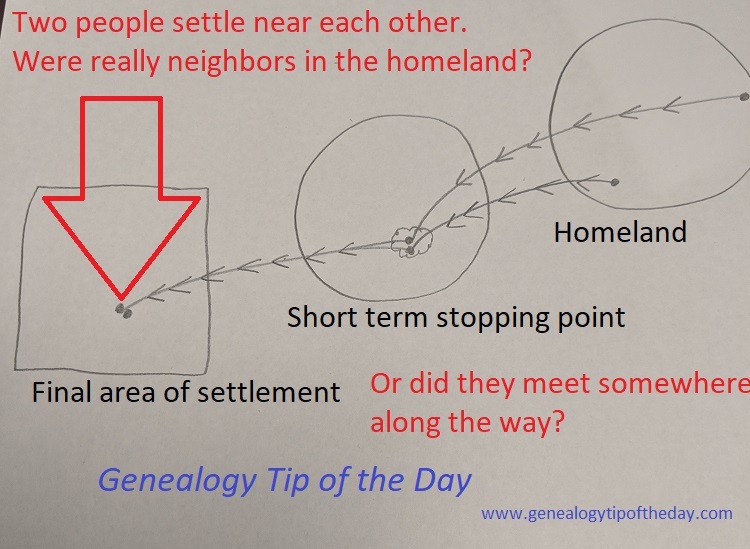 It’s possible that those neighbors from the same country who eventually settled near each other were not really neighbors in the homeland as well. It is possible that they connected at some point along the way and, because of their shared ethnic heritage, they relocated together. Possibly. Just don’t assume that immigrant neighbors with a shared ethnic heritage were always neighbors. Sometimes people made a pit stop along the way. ← When Did You Last Practice?